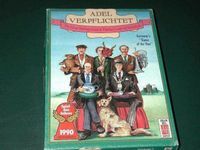 "Adel Verpflichtet" (early version of "Hoity Toity", only plays 5, not 6). Avalon Hill, English 1991 edition, with SdJ 1990 logo. Box is in very good shape, some shelf wear, but no structural damage. Contents in very good condition.